Combine cream cheese and horseradish in a small bowl. Spread cream cheese mixture onto tortillas. Cover with turkey slices. 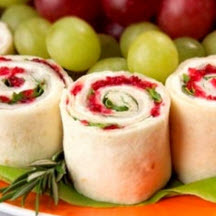 Spread with cranberry orange sauce and sprinkle evenly with the green onion and parsley, if using. Roll up jelly-roll fashion. Wrap with plastic wrap. Refrigerate 2 hours or until serving time. Slice each tortilla into 8 pieces. Nutritional Information Per Serving (1/24 of recipe): Calories 46 Fat 2g; Cholesterol 8; Protein 2g; Saturated Fat 1g; Trans Fat 0g; Sodium 105mg; Carbohydrates 5g; Sugar 2g; Iron 0%; Fiber 0%; Calcium 0%.